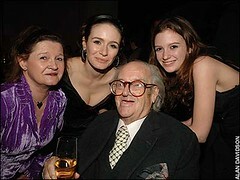 If you’ve seen Lars and the Real Girl, Match Point or 30 Rock, chances are you’ve heard of the brilliant Emily Mortimer – who happens to be the daughter of a renowned dramatist named John. 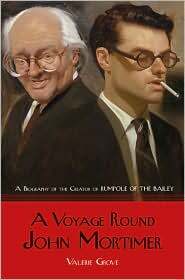 The Mortimer patriarch, known for the Rumpole series, is the subject of a new bio: “A Voyage Round John Mortimer” (by Valerie Grove). The book itself is quite thick and chronicles not only Mortimer’s professional life, but personal aspects, including his marriages to the Penelope’s and affairs. The book is on my list of potential reads, which needless to say, is a black hole. 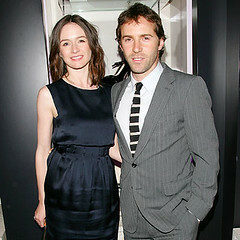 And anyone digging for the scarce documentation of Emily Mortimer’s son, Sam, with actor Alessandro Nivola, will find one photo in the bio. The photo is black & white with Nivola holding the tot, pacifier in mouth, behind the Mortimer clan. If the bone structure is any indication, the child has his father’s good looks. Sam was an infant when the photo was taken and is currently about five years old. There, Ms. Mortimer, you’ve just been (proverbially) Pap’d. Or, perhaps, literally.